Underground mining railways are of necessity little-known except by the miners, but it is an interesting thought that well over a thousand locomotives have gone underground in South Africa alone since the war. At the present time this market probably accounts for the most important part of the overall requirements for small narrow gauge locomotives. While rail haulage is going out of fashion on the surface, it still reigns almost supreme underground. Of course there are exceptions, and rubber-tyred transport is used in the less restricted workings, but rail transport is assured of a future for many years yet. As far as rolling stock other than locomotives is concerned there is need for vehicles to carry everything that has to be hauled underground. These range from passenger vehicles to ore wagons and even mobile toilets, which are the subject of these notes. 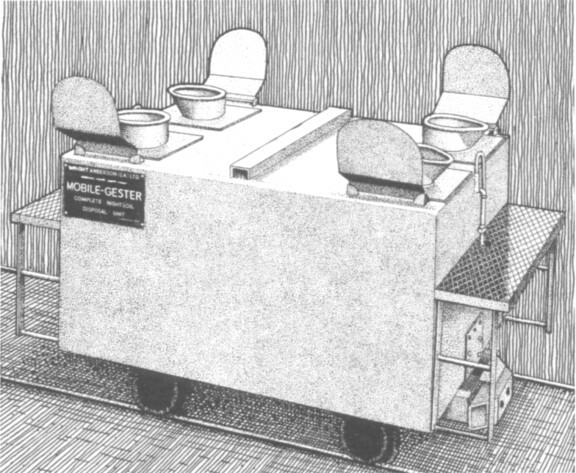 Our sketch shows "The New Four-Seater Mark V Mobile-Gester complete nightsoil disposal unit", the prototype being originally developed to provide an efficient and hygienic method of sanitation for mines (although models are now available for a wide range of surface applications). Designed primarily for use as stationary units, they can readily be transferred from one working face in the mine to another, and require little maintenance. Versions are available with seating for up to four persons, the standard four seater being 4ft 3in wide by 7ft 0½in long by 4ft 7¼in high from rail level. Screening is not normally supplied but brackets are fitted to multi-seat models to facilitate the erection of partitions between seats for segregating different categories of users. The disposal unit is self-contained and has a smell-free biological action; it requires a limited supply of water and compressed air, both of which are normally available at the face.